The Queue: What's the deal with Rossi? What’s the deal with Rossi? He rolls a warrior, gets it to max level, and then he rolls another warrior. Is he searching for something? Is he like Sisyphus? Doomed to level warriors and abandon them for newer warriors until the end of time? Did he know a warrior who died, and leveling warriors is how he remembers them? Does anyone really know what the deal is with them? If you really sat down, would you know the whys and wherefores of your hopes and dreams, your obsessions and quirks and caprices? I don’t know that I can truly answer your question, SPencer — seriously, what is the deal with that capital P — but I can try and work out some of it for you here. I think part of it is my attraction to heroic mythology. I wasn’t a big reader of Tolkien growing up — instead, the Iliad, Theogony, the Odyssey and Aeneid were my first exposures to stories of heroes defeating monsters and accomplishing epic feats. The Argonautica and the disparate stories of Heracles, Theseus, Perseus and Bellerophon from a worn copy of Bullfinch’s Mythology. As I got older, I got into Arthurian tales, the Norse myths (one of my treasured books is a copy of the collected Eddas) and the old English tale Beowulf. Later, as I got more into adulthood I discovered the Weird Tales era of Sword and Sorcery fiction, with writers like Robert E. Howard, Fritz Leiber, C.L. Moore and their predecessors like Edgar Rice Burroughs. I’ve often said that when presented with weird fiction, I prefer the Howard approach to the Lovecraft one. Lovecraft presents us with maddening cosmic horrors whose very existence contradicts what we hold most dear about reality, and Howard’s response is to pick up something sharp and hack it apart until it stops moving. It’s a very Greek mythological approach — Heracles discovers that he can’t just cut the Hydra’s heads off or it’ll keep growing new ones, so he burns the stumps. Can’t kill the Gorgons because they can turn anything that sees them to stone? Kill them using the reflection of one in a magic shield. Maybe it comes down to my having been a child that nearly died at my birth who has spent my entire life just trying to stay alive, but in me I find a longing for the escape of that kind of purity — the Kulls, the Beowulfs and Heracles and Theseus and Gilgamesh myths, the hero who triumphs and sometimes is even destroyed by strength of arms and a refusal to back down. Plus I like the mechanics of Warriors better than other classes. I like not having to reach out to a higher power — not the Light, not the Void, not the Emerald Dream or the Arcane or Fel, nothing but a sword and a hand to hold it in. No sneaking around and poisoning people, no pet to do the fighting for you. No spiritual balance or elemental spirts. Just you. I think I once described the class as being the bullet they fire at the enemy, and that’s an appropriate metaphor here — other classes use various means to accomplish their goals. Warriors are the means, their bodies and their weapons and their skill. Nothing else. I enjoy it. I like playing them. That’s ultimately it — why not do it again when I like it every time I do it? Q4tQ: Do you think Blizzard’s questing mechanics drive some of their story mechanics? For example, do you think Blizzard wouldn’t kill Tyrande because she’s the “head” in the Darkshore World Quests for Alliance and it would cause narrative dissonance? I’m trying to remember if a Talking Head* has ever later died but still remained to give instructions. I think once they killed Varian and Vol’jin, they were serving notice that literally anyone in the narrative could die if it served their purposes. I don’t think it would be all that hard to have someone else take over Tyrande’s quests if they decided she was going to die for their story, but I also see no reason for them to kill her when they can get a lot more mileage from keeping her alive. I’m not saying it has absolutely no impact, but I doubt being a quest talking head will save anyone. I mean, for me, the best expansion is still The Burning Crusade. Best is a pretty subjective word, after all. I was having the most fun and felt like TBC was a heck of an expansion, had some of the coolest raids and lore, and hadn’t gotten as out of control with raid difficulties and so on as it would later become. But the very idea of best expansion is really more about the person making the statement than the expansion being discussed. Still, 8.2 looks like a pretty big expansion full of interesting things. If you like World of Warcraft, it feels like an expansion that you could well enjoy. I’m optimistic that I will like it. So, I rolled up a Kul Tiran female hunter. And, my semi-pro photographer heart just grew two sizes, and I’ve been doing nothing but taking screenshots and looking for the best backdrops. I’ll be up front, I haven’t even been leveling my Kul Tiran this week — had a lot of RL stuff come up — but I still log her on just for screenshots. 5th “torch” on her path to freedom? Lotharfox answered you in (I think) a spirit of jest, but I do think it was an accurate statement — absolutely none of the mortal holders of Xal’atath owned the blade. However, I think that if we change your word to ‘holder’ or ‘wielder’ we can still think about the topic usefully. We should note that these are only the known wielders of the blade. Zan’do, the Gurubashi Troll who awakened Kith’ix with blood sacrifice using Xal’atath, starting the Troll/Aqir wars. Kith’ix itself may or may not have used the blade — the C’Thraxxi warlord awoke when Zan’do stabbed the dagger into its hide, but so far as I know there’s no reports of Kith’ix itself using Xal’atath directly. So we’ll assume he didn’t. From there, after a gap of thousands of years in which the blade may well have been used countless times, Modgud found and used the dagger during her invasion of Grim Batol. She died entirely due to Xal’atath abandoning her at her moment of greatest need, and after her death, the Human Priest Natalie Seline discovered both Xal’atath and the arts of the Shadow Priest — her death came when her followers murdered her in her sleep to gain the black blade for themselves. 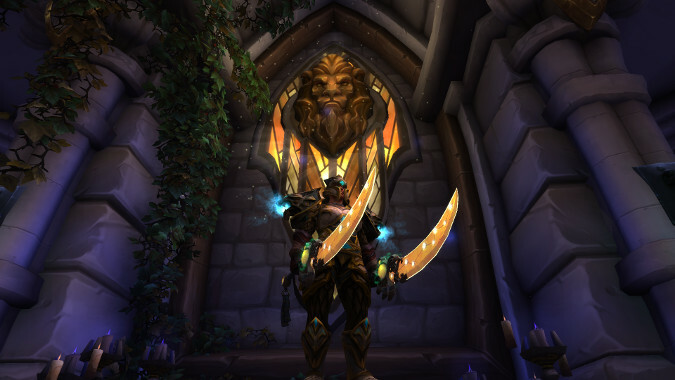 Finally, before the heroic Priest who wielded it during the Legion invasion of Azeroth, the blade was held by Twilight Deacon Farthing, who planned to use it to awaken another C’Thraxxi. The High Priest took up the dagger after striking down Farthing, who clearly had difficulty controlling its power. This means that we only have five known wielders of Xal’atath — Zan’do, Modgud, Natalie Seline, Farthing and the High Priest. Assuming you are playing a Priest, then yes, you’d be the fifth wielder of Xal’atath. However, if you aren’t playing a Priest? I don’t know if you count as a wielder. You never tap into the blade’s power — you even go so far as to empower the entity within the dagger to the point where she frees herself from the blade. It’s fairly obvious that any non-Priest never once wielded Xal’atath, and was instead wielded by her instead. I know that’s ultimately the fate of every actual wielder of the blade — Zan’do dies awakening Kith’ix, Modgud is abandoned by the dagger once she’s corrupted Grim Batol, Natalie Seline dies after she teaches shadow magic to Priests, and Farthing is slain trying to awaken another C’Thraxxi in order that Xal’atath can be placed in the hands of a more powerful and more gullible Priest, who places it in the perfect position to finally free itself from the dagger. So even if you’re not a Priest, you’re still in the shadow of the High Priest, who is the one who did all the steps leading up to this. So the theory might have some merit after all. Don’t be too quick to dismiss it. Okay, that’s the Queue. Seriously, buy my books. If y’all can ask me obvious “This will get Rossi to answer this question” questions, I can hype my stuff. Filed Under: What On Earth Is My Deal?